When you need a change in fortunes call the Bairns call on Queen of the South. There’s some twisted co-incidence that the Doonhamers handed Paul Hartley his first win as Falkirk boss just over 13 months ago, and then consigned him to the lengthy list of ex-managers in August. A change in fortunes, then the opposite change. 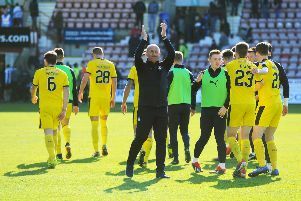 This time it was another positive change for Falkirk courtesy of three goals for Davis Keillor-Dunn, William Edjenguele and Demi Petravicius as Ray McKinnon racked up his first home win as Falkirk manager – the team’s first in the league this season, and carried on the positivity of 2019. Stephen Dobbie has been a feature of these meetings at Westfield of late and was going for a treble-treble against the Bairns – a third straight hat-trick at The Falkirk Stadium. He was lucky if he got three shots off on Harry Burgoyne’s goal as Abdul Osman marshalled the striker’s space in a tactical masterclass from Ray McKinnon. Osman’s midfield positioning was a one-off that paid dividends, but another masterstroke looks to have been made by the boss in the recruitment of Keillor-Dunn. The Englishman made the Bairns attack tick until his soft red card for two bookable offences in the second half – but still the Bairns didn’t wilt. If DKD couldn’t get in the Ross County team, just how good are the Highlanders? We’ll find out in ten days’ time, but they should have sewn up the title by now if this is the standard of their reserves. He hung in the space behind Zak Rudden and often Petravicius and the trio were all on-song against the Doonhamers. Petravicius was positive, DKD a crafty threat who cast a shadow on goalscorer Rudden whose link-up play benefited from the two around him. All round this was just a good day to be a Bairn, and the new recruits looked the part at last. Front to back Falkirk looked assured against a team which had comfortably dismissed Premiership side Dundee from the Scottish Cup just a couple of days before. The midweek match might have jaded the visitors, but at full strength they’d maybe only have reduced the arrears, because Falkirk more than deserved all three points. Few critics in the stand will be finding fault with the performance that will propel the Bairns up the table if it can be repeated frequently, if not consistently. They’ll even overlook the omission of fan favourite Tommy Robson if William Edjenguele and Paul Dixon can continue to perform so soundly. The only down side was the red card for Keillor-Dunn fromreferee Gavin Duncan that means he won’t be picking apart the Alloa defence next weekend. It was a soft decision for kicking the ball away and a meaningless tug, but then again, the more things change, the more things stay the same.